Searching for quick and easy certificate of appreciation templates? We offer certificates of appreciation in PDF format. Unlike Microsoft Word certificate templates, our templates are pre-designed and offer limited ability to change their look and feel. But the advantage is that it's super-quick and easy to do. 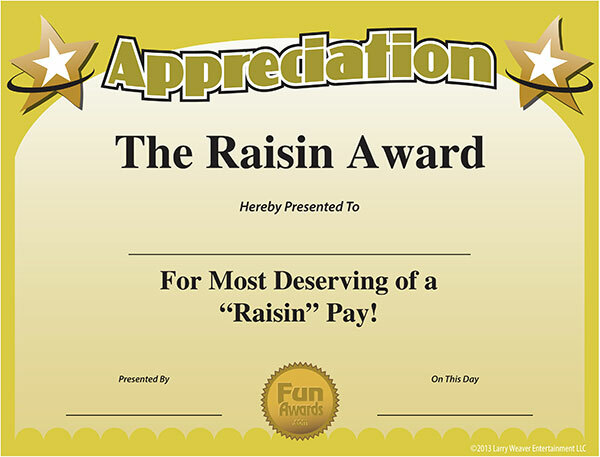 Download "The Raisin Award" certificates of appreciation for free. Be sure to download the free sample certificate of appreciation to make sure the PDF is right for you before making a purchase.